I suppose the animal is a horse or some sort of winged stallion? John and Henry Lias Sterling Silver Kings Pattern Dinner Forks. The motto is "Honi soit qui mal y pense" and it means "Shame be to him who thinks evil of it" in French. This is a very famous society and the Queen of England and the Prince of Wales are among 24 members, not including the supernumerary members. WIth a bit of research we might even be able to identify which family owned these forks, based on the horse in the center and the crown at the top. Also that strange symbol there at the bottom is most likely St. George slaying the dragon, a common symbol of this Order. Can't clearly see the (horse?) image, but isn't a red dragon-like creature in flight associated with Wales? If you can enlarge the image and reduce any glare from lights it might help a bit. Can see now the dragon would be "guardant" with wings raised, some versions being rampant when pictured outside of a pennant. I guess we can rule out the Prince here, especially without the feathers. Anyhow, your beast appears charging but that head is awfully dog-like. Would a dog headed creature (like a wolfhound head) be used in a British crest? Now I am not sure that strange symbol at the bottom is actually St. George slaying the dragon. It looks like a cross between a greyhound and a dragon with wings. The face is quite similar to a greyhound. An internet search should bring up a list of Knights of the Garter with their dates. The Earl of Winchelsea was a knight at the right time. His crest, a pegasus, seems to me as close to the one on your forks as anything, but you might want to check this out for yourself. Earl Of Winchilsea is the most likely candidate, the animal is a peagasus or winged horse. Does the seal of the Royal Order Of The Garter surface very often in the Antique Sterling SIlver population? The 9th Earl of Winchilsea was an important figure in the history of Cricket in England. It could have also been the 10th Earl of Winchilsea, who was a more important politician and was in a famous duel. The garter is not hereditary. You need to stick with an earl who was a knight of the garter at the date the forks were made, bought and engraved. 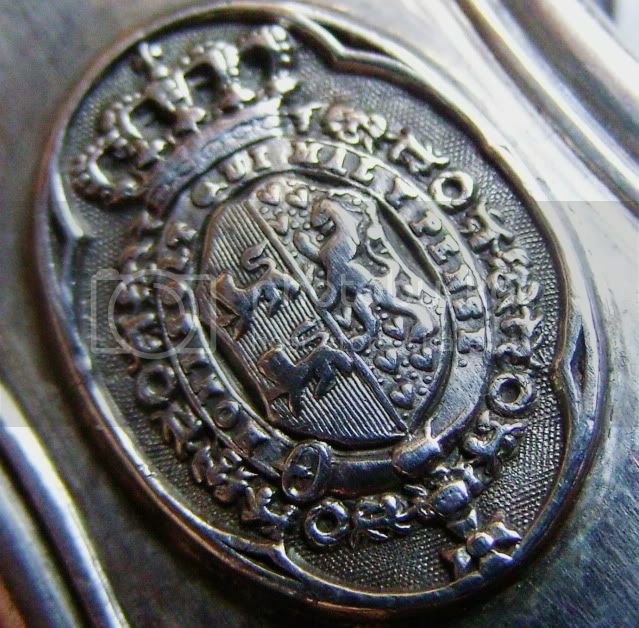 The garter is not that common in engravings on silver because there is a limited number of knights at any one time and they don't all necessarily include the garter in their inscriptions. If we are agreeing the fork was assayed at London in 1817, then I agree the crest and garter are for George Finch, the 9th Earl of Winchilsea, who was installed as a Knight of the Garter in 1805. I think the confusion about what is below the garter may come from calling this a "seal". The garter is what we now call a belt. It is a small blue velvet strap worn around the left calf by knights and on the left arm by ladies. In the heraldic tradition the buckle is in the 7 o'clock position and the metal end tip is what is hanging below. "A Prince can make a belted knight..." (R.Burns). Best regards. Indeed, I could not identify the symbol at 6 o'clock, however I did notice the buckle at 7 o'clock. Also I just checked the "Coronet Of An Earl" and I was struck by the similarity between the two symbols. It is amazing how similar the crown on these spoons is to the generalized "Coronet Of An Earl" that you see in the descriptions of various nobility houses. The symbol at 6 o'clock I thought was a symbol of St. George Slaying the dragon, or perhaps a miniature Pegasus, but indeed it could be some extension of the garter symbol that would naturally fall right next to the buckle part. Try for a size my own Order of the Garter with buckle correctly at 7'o'clock. Set of cutlery belonging originally to Duke of Brunswick-Luneburg, uncle to Queen Victoria. I hasten to add that the Honorable Order of the Garter is within the House Order here, that of Henry the Lion of the House of Brunswick. And Here is a pic of the Wreath with the Cross which represents the Order Of The Bath. So your amazing family crest has both the Royal Order of the Garter and the Order of the Bath.